From a recent media release a company spokesperson indicated the carrier has planned to reduce its fleet to nine aircraft in 2015 from the current 11. Therefore it’s only logical that not one of the new planes is to be withdrawn unless in its present precarious financial position, they became unable to meet the lease payments. The ATR 42 seats 48 persons and the ATR 72, 68 passengers. 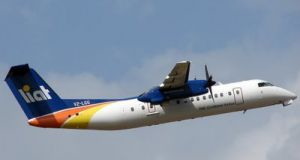 The Dash 8 – 300 seats 50 persons. So to imply that they have lost traffic due to smaller aircraft is entirely erroneous. In fact the 9 remaining aircraft overall will actually have 56 more seats collectively that a similar number of Dash 8’s. Again I would plead with those entrusted in disseminating information about our vital tourism industry to be better informed. Or alternatively surround themselves with people better briefed on the sector to avoid further confusion and misunderstanding. So with a projected fleet reduction of a further 20 per cent, almost 90 per cent of which being less being two years old, will the reductions in operating costs promised by the introduction of these new aircraft finally become a reality? Another question to be answered is has the fire at the company’s headquarters back in June 2012, which at the time was described by a senior official as a ‘catastrophe’ and estimated to have cost EC$150 million. What part has this played and did it further delayed fiscal ‘revival’? No mention has been made insurance? A number of aircraft are still listed as ‘stored’. Did the destruction of engineering, maintenance and other critical records in this fire prevent the saleable realisation of these assets? The most recent media discussions mention ‘staff reductions’ and it must be clear to all involved that no commercially driven entity in our current environment could possibly sustain up to nearly 100 employees for each operational plane. Could this be a benchmark time in LIAT’s long history? With effective management, cost curtailment, transparency and accountability, could the shareholders (taxpayers) finally witness the road to recovery? Many of us desperately hope so, as clearly we need a healthy profitable regional carrier if we stand any chance of restoring intra Caribbean arrival numbers. Is there any truth in the rumour that LIAT has placed first class pilots on hold but still pay them wages? Would it not be better to find work for them to do or suggest that they explore the job market? There are few answers from Gubmints on every and anything….why would LIAT be different? Someone who read this column brought up a very good point which I had overlooked. With the downsized fleet does this mean LIAT will cease to offer a freight service or carry any substantial volume of freight on their nine remaining passenger planes? If so, is this another impediment to intra-regional trade? Has this been thought about?